Studio group portrait of six Australian Prisoners of War (POW) at Friedrichsfeld POW camp. 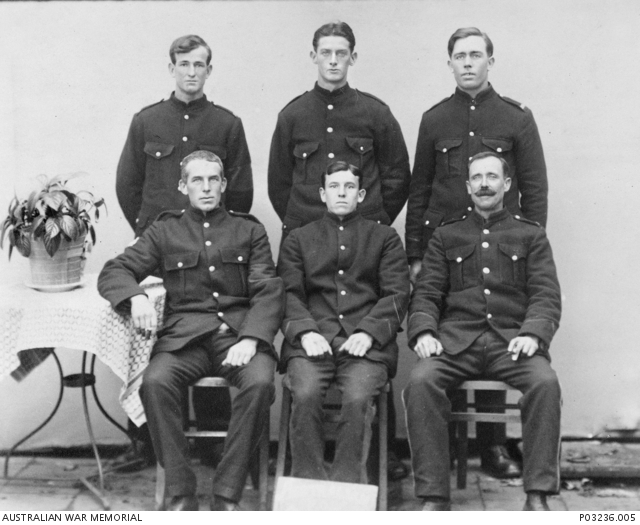 Identified, left to right, back row: 3647 Private (Pte) George Joseph Henry, 54th Battalion, from Dubbo NSW; 4189 Pte Alexander Moffatt Duff, 54th Battalion, from Sydney NSW; 4828 Pte Arthur McKell, 53rd Battalion, from Orange NSW; front row 3237 Pte Joseph Henry Grimes, 55th Battalion, from Sydney NSW; 4310 Pte Walter Martin Hoare 54th Battalion, from Sydney NSW; 3474 Pte William George Hall, 54th Battalion, from Warrawee NSW. Pte Henry enlisted on 5 October 1915 and embarked for overseas on 20 December 1915 aboard HMAT Aeneas. He was captured at Fleurbaix, France on 20 July 1916 and held as a POW until he was repatriated to England in December 1918. He embarked to return to Australia in April 1919. Pte Duff enlisted on 25 August 1915 and embarked for overseas on 20 December 1915 aboard HMAT Aeneas. He was captured at Fleurbaix, France on 20 July 1916 and held as a POW until he was repatriated to England in December 1918. He embarked to return to Australia in February 1919. Pte McKell enlisted on 22 September 1915 and embarked for overseas on 8 March 1916 aboard HMAT Star of England. He was captured at Fleurbaix, France, possibly also on 20 July 1916 but certainly some time before 12 August 1916 when he was listed as a POW by the Germans. He was repatriated to England in November 1918. Pte Grimes enlisted on 28 July 1915 and embarked for overseas on 20 December 1915 aboard HMAT Suevic. He was captured at Fleurbaix on 20 July 1916 and held as a POW. He was repatriated and embarked to return to Australia in February 1919. Pte Hoare enlisted on 8 October 1915 and embarked for overseas on 20 December 1915 aboard HMAT Aeneas. He was noted as a POW on a German list dated 8 September 1916 and is recorded as having embarked to return to Australia in March 1919. Handwritten notes on back of photograph read: “November 25th/11/17. From W.G. Hall, No 66487 Friedrichsfeld, Bei Wesel, Rheinland, Germany. From the boys of this command wishing you and your staff a Merry Xmas.” One of a series of over 400 photographs sent by Australian POWs in German camps to Miss M. E. Chomley, Secretary, Prisoners Department, Australian-British Red Cross Society, London. Original album housed in AWM Research Centre at RC00864, Album image number 15.